Do we need a national minimum wage to improve income equality? The ANC has pledged to investigate the introduction of a national minimum wage “as one of the key mechanisms to reduce income inequality”. When contemplating this question, I suddenly wondered: Are there in fact any countries with no form of minimum wage? And if so, what happens there? What I discovered, was most interesting. Surprising in many ways. But first of all, a bit of structure: The term “minimum wages” can be used in one of two ways: It either means a national or regional minimum wage set by the government or one of its agencies, or it means a wage negotiated by unions and employers in industry-specific collective bargaining forums and then often extended by law to other players in the particular industry. Many countries do not have minimum wages in the former sense, but then do in the latter sense. And believe it or not, there are a few countries – only a few mind you – that have neither type of minimum wage. It is important to know that normally the first type of minimum wage has universal application, whilst the other only applies to specific industries, sometimes only to parties to the bargaining structure, and sometimes also to non-parties. This is useful to know, because if minimum wages hamper employment creation, then we would expect minima that apply to sections of the workforce only, to be less damaging. The other piece of structural understanding that is useful, is that there are countries where there is no minimum wage, but the economic market is not free – that is, it is over-regulated. Those countries do not really assist in assessing the employment and wage outcomes of the absence of minimum wages. Predictably their economic performance is poor, and for purposes of this discussion they be discarded. All 5 countries with no minimum wages are very rich – bar one they fall in the top ten richest countries in the world. All the countries (both those with minimum wages, and the peer group of high-income countries) have relatively free markets. The countries with no minimum wages outperform their peers in terms of per capita GDP by a considerable margin (about 25%). Their Gini coefficient (measuring income inequality) at 43 compares well with the world average (52), but lags behind the average Gini of their peers (31). 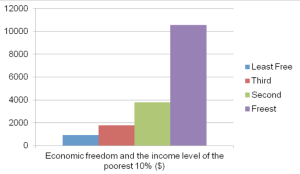 The absolute income of their poorest 10% is better than the world average, but significantly worse than that of their peers. Significantly, the no-minimum wage countries vastly outperform their peers in terms of unemployment (2.5% vs 6.42%). What does all this mean for policy in South Africa? What we can see, is that it is possible, even likely, to have high income and low unemployment in a no-minimum wage set-up. 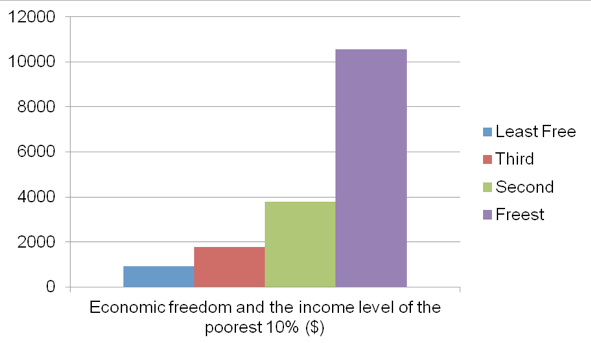 But we also see that inequality is higher in these societies than in their peer economies. Does that mean that job growth comes at the expense of inequality, and how important is that? Between 1970 and 1980 (the period of the so-called oil crisis) the crude oil price measured in constant prices rose to an unprecedented peak. During this period the per capita GDP of the three countries all rose dramatically and peaked in 1980, in tandem with the oil price. Qatar’s per capita GDP, for example rose from $4929 to $35029 in that period. When the oil price dropped in 1998, it reached a low of $18634. In 2012, again in tandem with the oil price, it reached a high of $93831. Personal income fluctuated in a similar way. So for example the per capita income in the UAE almost doubled in the period 1995-2007, a period during which the oil price shot up to record highs. Besides, Brunei and Qatar have been so coy with their equality data that it is impossible to evaluate them for present purposes. That leaves Singapore and Hong Kong. Both of these countries are useful in our case, because they are diverse, heterogeneous societies which at one stage needed to lift almost their entire population out of poverty. During the mid-sixties the two countries and South Africa were peers – waiting in in the emerging-country starting blocks as it were, at about $650 GDP per capita each. Since then Singapore and Hong Kong have grown to $50000 and $36000 respectively, while SA still lounges at about $7000. Both East Asian countries experienced increases in inequality over the last 2-3 decades. In Hong Kong the Gini coefficient increased from 4.53 to 5.33 between 1985 and 2008, an increase of 17%. In Singapore it increased by a similar percentage (17%) over the period, namely from about 4.1 to 4.8. Again: Does that mean we in South Africa will be better off, and more effectively combat inequality by introducing a national minimum wage? Inequality Watch did a study in 2012 that compared and assessed OECD countries in terms of changes in inequality that they underwent from 1985 to 2008. Whilst noting that there was a general trend during that period for inequality worldwide to increase, there were significant differences between individual countries. Countries whose income inequality increased: The USA, the UK, Australia, Canada, Finland, Sweden, Denmark, Norway, Portugal, Italy, Germany, Italy, Germany, the Netherlands and Austria (by about 13% on average). The group whose inequality increased: 7.6%. 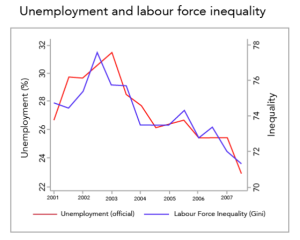 It is quite clear that countries that succeed in maintaining or reducing inequality, tend to suffer higher unemployment. Now it will be remembered that we analysed the countries that have neither type of minimum wages, and that their average unemployment rate was 2.52%. So it seems that a country that wants to reduce its unemployment, is clearly better off without any form of minimum wages. Although it appears to be marginally better to have parties negotiate minimum wages in collective bargaining structures, that is exactly what it is: only marginally better. First prize goes to a free-market economy with no minimum wages. 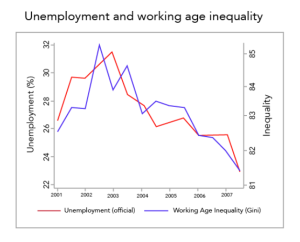 The other lesson that we learn from this is that it is possible in a modern economy to reverse the international trend towards inequality, but that comes at an enormous price in terms of unemployment. 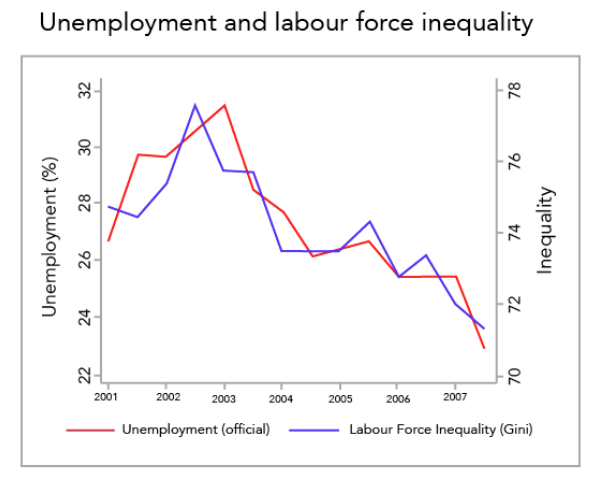 Even just maintaining the same level of inequality, exacts a massive pound of flesh in terms of lost jobs. The above statistics thus seem to confirm what many left-wing commentators have been telling us for years: the minimum wage helps to maintain or improve equality. So does that mean we should introduce the minimum wage in South Africa? It follows that we in South Africa must do whatever we can to grow employment, if we are serious about reducing income inequality. But even if job creation does increase inequality, (as some of the above statistics suggest), does that still mean that we should not do everything in our power to give jobs to the 7 million unemployed? The point that we must not lose sight of when assessing job creation as a tool to reduce inequality, is that a country with successful job creation also grows the wages of the poorest workers. In the two examples that we looked at earlier, namely Singapore and Hong Kong, this is illustrated very well. In 1985, for example, a Hong Kong worker in the poorest 10% of the workforce (precisely the group that the minimum wage would normally target) would have earned about $1560 in current prices. Today that same worker would earn $7693, a fivefold increase in real terms. Singapore’s figures yield a similar result. In short: Whilst adding about a million jobs (about 38%) to its workforce, Hong Kong also grew its lowest-paid workers’ income by 500%. No wonder it did not bother with minimum wages. In South Africa the hard policy question that we must ask, is whether we dare flirt with the idea of improving inequality by means of minimum wages. If we look at the tragic price paid by Turkey and Greece in terms of job losses, it hardly seems worthwhile. Besides, it seems as if we, at our current stage of development, will in any event improve our income equality if we simply do whatever we can to increase employment. Finally, it boils down to this: will a national minimum wage help or hinder job creation? 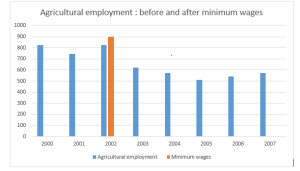 Few industries offer as dramatic an illustration that a sanguine attitude about the effects of minimum wage legislation on employment growth is misplaced, than does the agricultural sector. Immediately before the introduction of the law, the estimated number of employees was 824 954 in the sector, whilst a year later it was 622 328 (2003), declining to 574 101 in 2007. The study rules out other factors such as economic growth/decline in explaining the results. “….. the oft-stated assertion that recent research fails to support the traditional view that the minimum wage reduces the employment of low-wage workers is clearly incorrect. …..among the papers we view as providing the most credible evidence, almost all point to negative employment effects, both for the United States as well as for many other countries. Two other important conclusions emerge from our review. First, we see very few – if any – studies that provide convincing evidence of positive employment effects of minimum wages, especially from those studies that focus on the broader groups (rather than a narrow industry) for which the competitive model predicts disemployment effects. Second, the studies that focus on the least-skilled groups provide relatively overwhelming evidence of stronger disemployment effects for these groups.” (Emphasis added). they had between 7 and 8 years of education. In a nutshell: they were typical of the most vulnerable group of marginal workers, with the exception that women are probably even more exposed to economic depredations. The typical farm worker comes from that sector of society that is by far the most exposed to unemployment and poverty. Seen from the perspective of labour market policy, it is precisely workers like these – marginal workers – who most need to be absorbed into the economy. The proportion of the unemployed who have not completed secondary schooling is 59.7%, amounting to more than 2.8 million workers. These numbers are particularly disturbing if one considers that the labour market participation rate for African people in 2012 was 51.8% (compared to, for example, the United Arab Emirates at 91%, Brazil at 85%, China at 85% and India at 85%). That means that in South Africa almost half of all Africans of working age are not part of the economically active population, and have lost all interest in finding work. The result is that in 2012 the labour force absorption rate of Africans, namely the proportion of working-age Africans that is employed, was a paltry 36.9%. That means that more than 60% of Africans of working age are idle. These are the people who need to be drawn into the labour market if we are serious about fighting poverty and reducing inequality. Since 2010 events at least as dramatic as those in agriculture, have been playing themselves out in the clothing industry. In that year hundreds of employers were fingered by the National Bargaining Council for the Clothing Industry for breaches of minimum wages and other prescribed terms and conditions of employment imposed on them by the extension of bargaining council agreements. In the end the closing down of several hundred employers was prevented only because of political intervention, whereby a moratorium was imposed, saving not only the employers, but thousands of employees employed by them. If the bargaining council in the clothing sector had followed through on its initial threat to levy execution against the recalcitrant employers, it is certain that hundreds of them would have closed down and thousands of employees would have lost their jobs. Although skilled to a degree, workers in the clothing sector, especially these marginal ones who stood to lose their jobs, are not highly educated and trained employees. And yet they have the ability to make a real contribution to wealth creation if allowed to charge market-related wages for their services. The reason why the unskilled and low-skilled sector is an obvious victim to laws such as minimum wage legislation, is fairly obvious. It is the marginal worker who needs to offset his lack of training, skills and experience with the compensating advantage of accepting a lower wage. That lower wage will very often fall below the prescribed minimum wage. This truth has been abundantly illustrated in the agricultural sector example cited earlier. At the time of the introduction of the minimum wage, the market wage in that industry was at least 17% lower than the minimum wage on average. It is no wonder that dramatic results followed. The same applies to the clothing industry, where for example in non-metro KwaZulu-Natal, 3 200 employees worked in firms where the lowest wage was R300,00 per week, at a time when the prescribed minimum wage was R684,25. In South Africa we must bear in mind that we have another problem that greatly exacerbates the threat of unemployment through the operation of minimum wages, and that is our notoriously ineffectual education system and resultant low levels of literacy and numeracy. We absolutely have to find work for the millions of almost unemployable workers who are victims of this system. There is no time or resources to educate the school leavers who have already been released onto the employment market. It is enough of a burden to try and bring the standards of education of the current body of learners up to scratch; it is a forlorn hope to attempt to play catch-up with workers already in the labour market. Their best hope by far is to get jobs, albeit at modest wages and terms of employment, so that they can at least start acquiring some skills through on-the-job training, which will make them better employable, give them a chance of promotion and advancement and improve their bargaining power. If South Africa is serious about addressing the plight of the most vulnerable sector, namely the typical unemployed person who is African, lowly educated and lacking in skills, and thus address inequality of income, the last thing in the world we should do is to introduce a national minimum wage. Hong Kong only got the minimum wage in 2011, too recent to influence the outcomes given here. Average of peer states selected on basis of average per capita income: Australia, Austria, Canada, Ireland, Luxembourg, Netherlands, Norway, Sweden, Switzerland, USA. 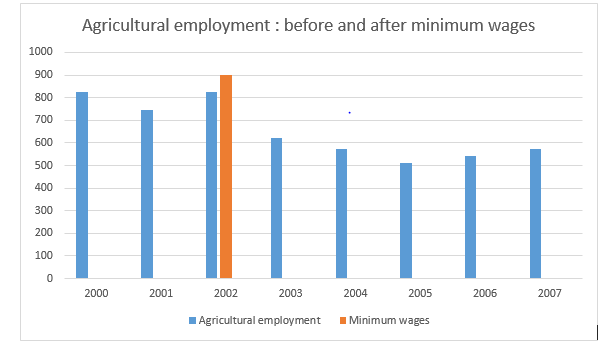 Bhorat, Kanbur & Stanwix: Estimating the Impact of Minimum Wages on Employment, Wages and Non-wage benefits: The case of agriculture in South Africa, University of Cape Town 2012.